Saturday night in a vibrant Islington, the pubs filling up with groups of friends meeting and a bit of a buzz in the air, none more so than in the small indoor shopping centre set back from the main drag which, incongruously, houses the two separate O2 Academy stages; on this evening the more intimate upstairs venue, with lighting that could be classified without fear of contradiction as “subdued”, was the host for Wille & The Bandits. This was my first encounter with the much talked about hirsute trio from Cornwall. Before they came on stage other audience members were excitedly informing me about how good they were live; indeed they were, brilliant in fact! On paper it sounded potentially like a recipe for an evening of overblown self-indulgence: three talented virtuoso musicians going at full pelt, non-stop instrumental interplay and a 6-string bassist to boot; it sends shivers down your spine at the thought of some dreadful jazz-rock combo battling themselves into a stupor. The difference with Wille and the Bandits being that they have a bunch of cleverly arranged, powerful melodic songs with great hooks, none more so than the tasty morsels offered up from their magnificent current album “Paths.” Opening up with the riffing “Victims of the Night” the strength of their musical vision was immediately apparent, the punchy rhythm stopping halfway through for a spacey blues interlude that led into an almost prog style up tempo solo that remained lyrical throughout before effortlessly kicking back into the catchy “Batsh*t crazy” chorus. Apart from the all-embracing wall of sound the trio create they also provide a visually interesting spectacle: lead vocalist Wille Edwards is a compelling figure, giving everything to his raspy vocals, neck muscles straining while he alternated mostly between his Gibson and a lap steel – which added wonderfully to the wide musical soundscape – his face frequently caught in a snarl as he gave all his energy to each number, hair falling over his eyes. Stage left, the curly haired and amiable waist-coated figure of Matt Brooks, looking like he’d just stumbled in from rehearsing with the Average White Band, was doing some incredibly nimble fingered work that was a show in itself; he later switched to a Heath Robinson style home-made double bass mid-way through the set which was also used to create some delightful sounds via an array of pedals and other effects when played with a bow. His backing vocals also added greatly to the overall sound. Behind the two front men, drummer Andrew Naumann provided an impressive selection of complicated but not too busy beats while projecting an Old Testament prophet meets 1968 version of Peter Green vibe. Talking of which, that particular legend’s name was invoked as the band kicked into their own superb version of “Black Magic Woman” which fused ‘Mac with Santana plus their own added Bandit sauce. Each song had its own dynamic, a couple of my personal favourites were the funky groove and infectious chorus of “Keep it on the Down-Low” (that’s going to stay in the live set for a long time) and the excellent “Judgement Day” with its distinctive jaunty guitar hook. The slow burn of the acoustic based “Mammon” was another highlight. 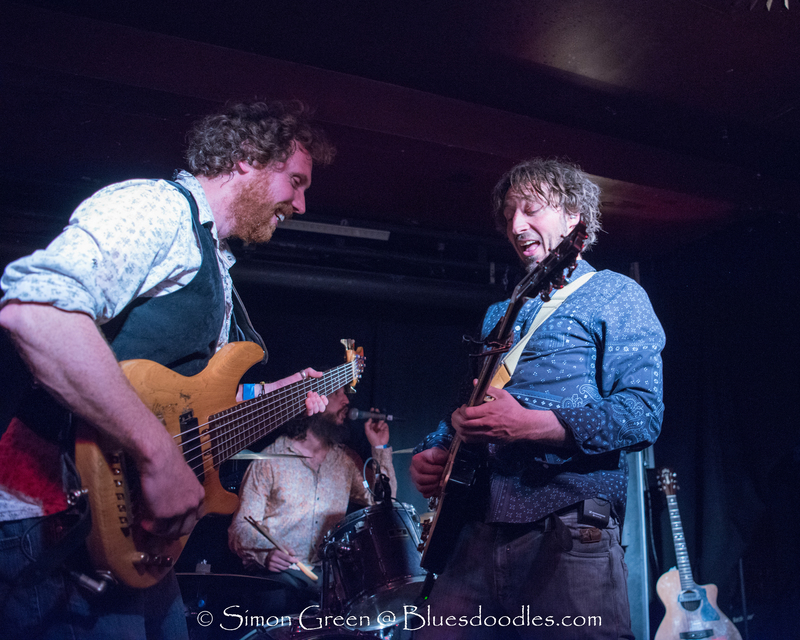 The word eclectic often gets misused but not in the case of Wille and the Bandits who take a variety of rich ingredients from the past and put it into their particular blender to produce an imaginative take on the blues that is totally original. Catch them when you can.